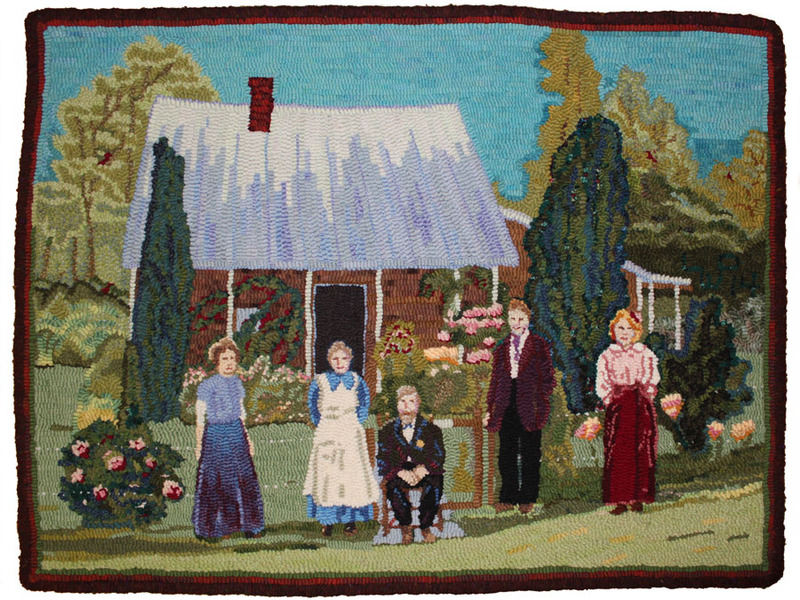 This rug has been hanging in my mother’s dining room; her father’s family, after all. Recently, her friends from her Pleiades Art Group came for a Tea Party. Emma was telling them about the family in Fox Hollow, Southeastern Ohio; when I heard a voice say, “why is Belle in her housecoat?” Aah, nothing like a group of artist to ask the hard questions… ha! I’d been wanting to give Aunt Belle a red dress, but a red velvet skirt would do! And once I added a red velvet skirt to the piece, I had to add red and burgundy around the rest of the piece; red in the flowers on the porch, red in the peonies by the fence, and red cardinals in the trees! Wow! Love that red; it really jazzed everything up! Thank you Pleiades! 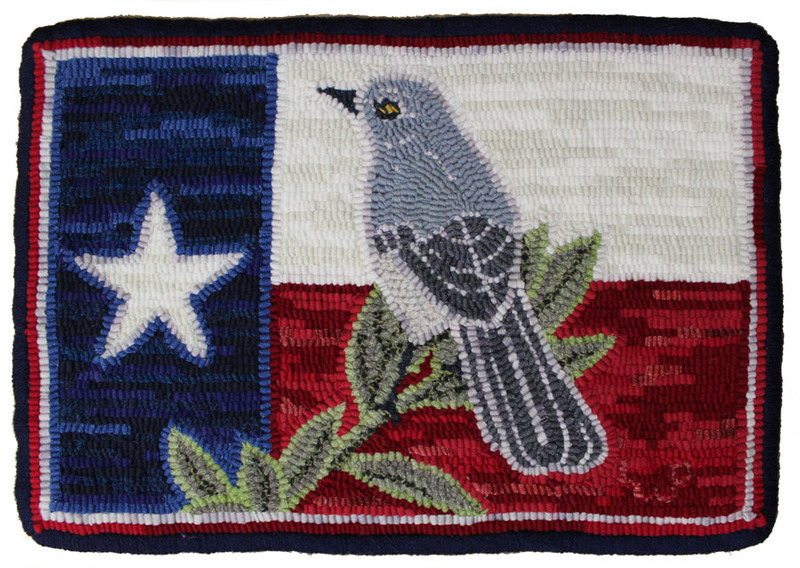 Then there was that Mockingbird for Texas… that eye was really bothering me. 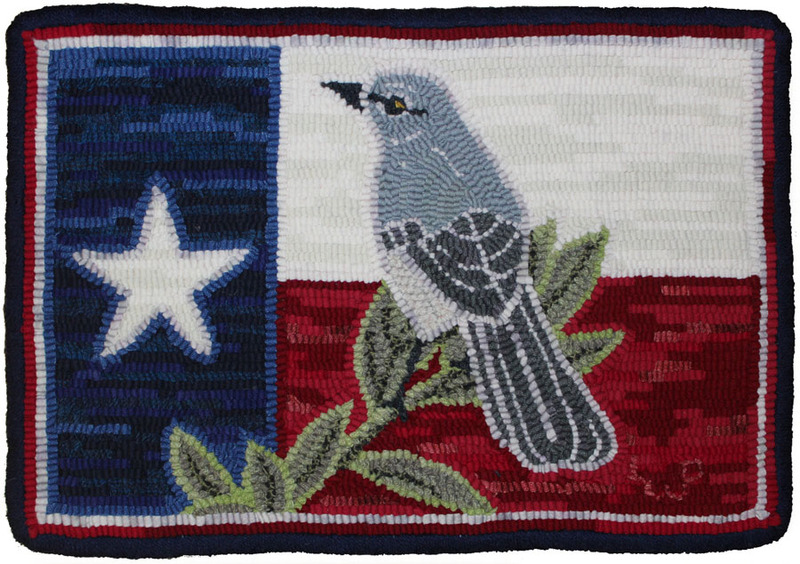 It’s an auction item for the 2015 ATHA Biennial in San Antonio, Texas… it needs to look spectacular! I’ve been preparing for my class at Biennial and when I finally wrote out the instructions for hooking the mockingbird… I realized that the eye merely needed a few changes. The mockingbird has a couple of dark streaks beyond her eyes, and the highlight needs to be small and to one side. Wow! What a difference a little dark makes! 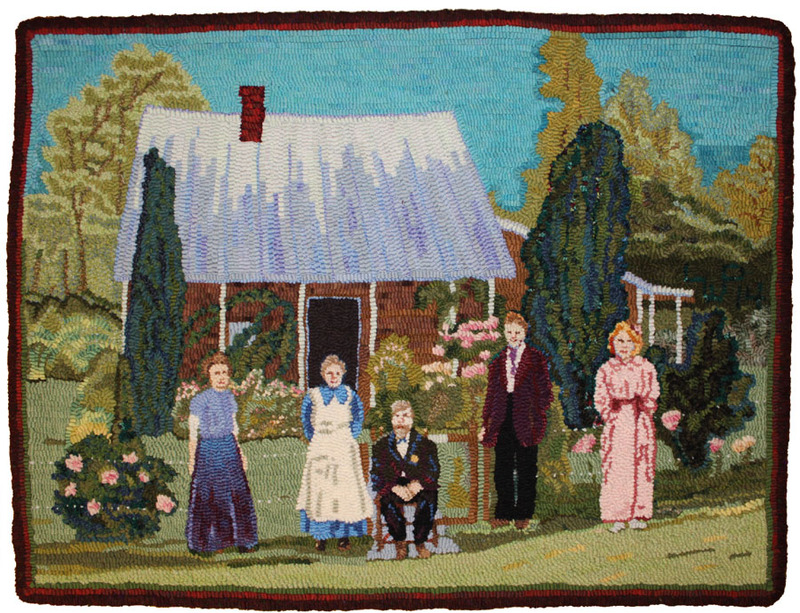 Yes… rug hooking is the forgivable fiber art… you can change a few loops today… or tomorrow… or a few years from now. Good to see a blog from you! That red really jazzed things up. Sometimes we just need a little more time to take a fresh look at our work! But I couldn’t find the cardinal???? The cardinals are ‘snuck’ in… 2 on the left and 2 on the right… in the trees at the back. they are hard to see in this photo… the one high in the trees on the left is the biggest. Nice, Laura. I miss the Cardinals of the East. Have a great trip to Texas and a wonderful class!